Map of Salvation's Islands and their location. The Salvation Islands (French: Îles du Salut, so called because the missionaries went there to escape plague on the mainland; sometimes mistakenly called Safety Islands) are a group of small islands of volcanic origin about 11 kilometres (6.8 miles) off the coast of French Guiana, 14 kilometres (8.7 miles) north of Kourou, in the Atlantic Ocean. Although closer to Kourou, the islands are part of Cayenne commune (municipality), specifically Cayenne 1er Canton Nord-Ouest. Devil's Island, the most famous due to the political imprisonment there of Captain Alfred Dreyfus, is better known to French speakers as "Île du Diable". The total area is 0.62 square kilometres (0.24 square miles). 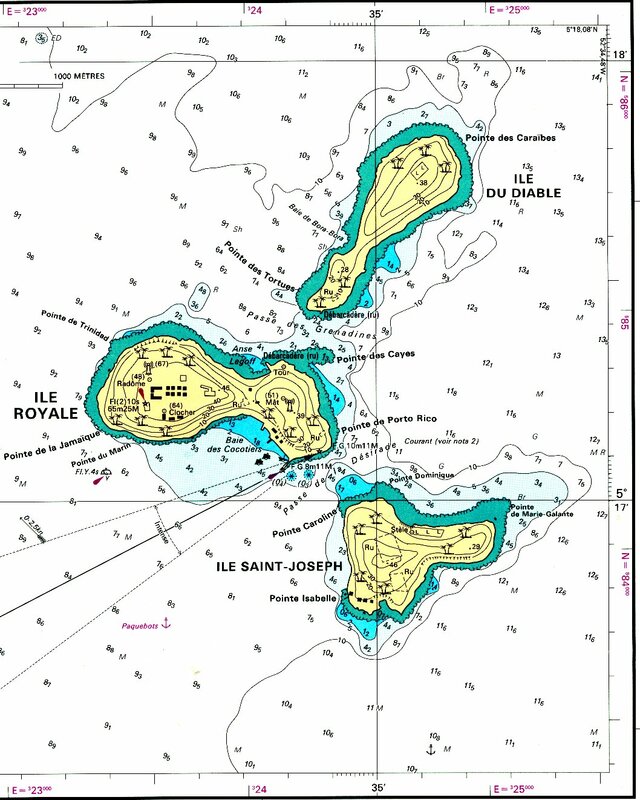 Devil's Island and Île Royale are separated by Passe des Grenadines, Île Royale and Saint-Joseph Island by Passe de Désirade. The islands were part of a notorious penal colony from 1852 onwards for only the worst criminals of France. The main part of the penal colony was a labor camp stretched along the border with Dutch Guiana, which today is Suriname. Île Royale was for the general population of the worst criminals of the penal colony to roam about in moderate freedom due to the difficulty of escape from the island. Île Saint-Joseph was for the worst of those criminals to be punished in solitary confinement in silence and for extra punishment in darkness of the worst of the worst criminals of the penal colony. Devil's Island was for political prisoners, including Dreyfus in 1895-1899 after his conviction in metropolitan France for treason. This penal colony for the very worst criminals of France was controversial for it had a reputation for harshness and brutality. Prisoner upon prisoner violence was common, tropical diseases would kill many others, and a small core of broken survivors would return to France to tell how horrible it was and scare other potential criminals straight. This system was gradually phased out and has been completely shut down since 1953. Nowadays the islands are a popular tourist destination. The islands were featured in the novel Papillon, by Henri Charrière. He was imprisoned here for 9 years. Joseph Conrad's short story An Anarchist (1906) is largely set in Salvation's Islands. This page was last edited on 4 February 2019, at 14:59 (UTC).